The Addison is a simple, elegant table that contains sweeping lines all around it in a Natural Teak finished look. 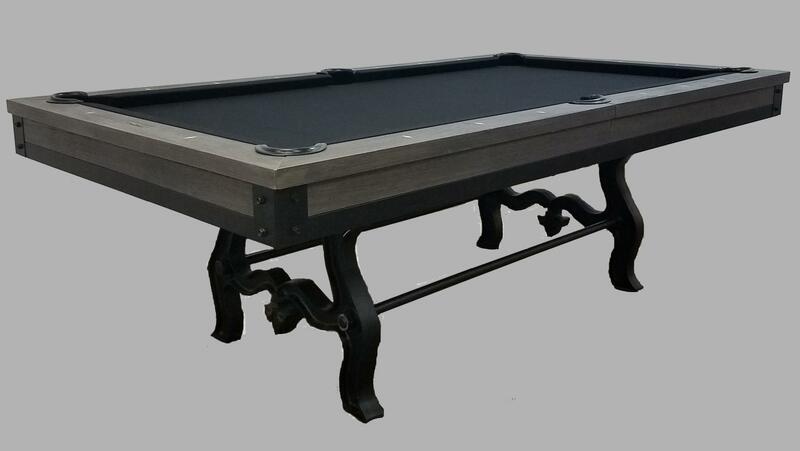 It has wide scalloped top rails and blinds and is available in an 8ft size table. The leg option that is available for this table is the Ram's Head. The Black Diamond has a black contemporary laminate table that includes the chrome corner caps and trim all around. 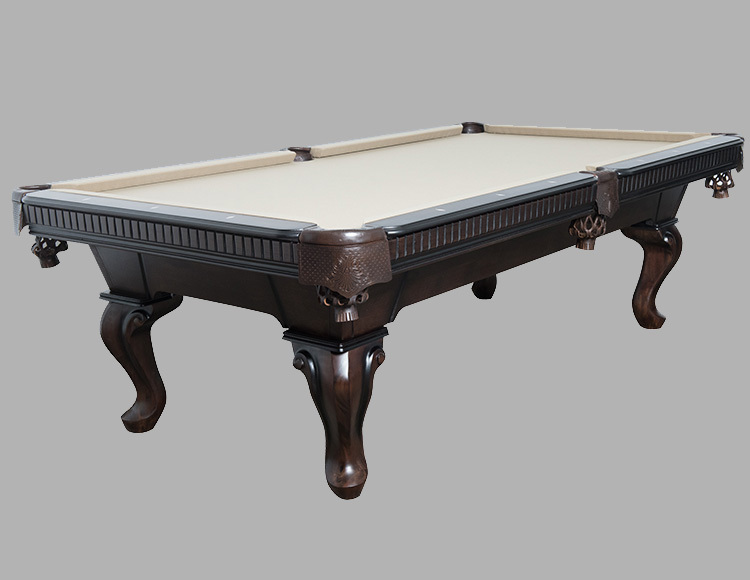 It is a burn and scratch resistant laminated table that will keep it looking fresh and new for years to come. It is available in 7ft and 8ft. 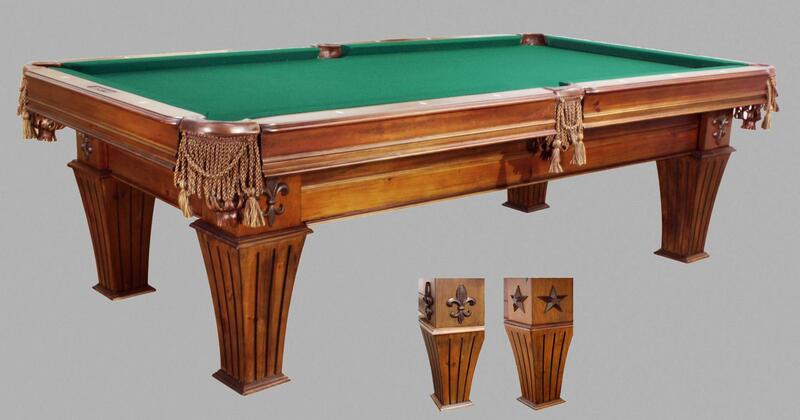 The Brittany is a solid wood tabled that has a tapered leg option that includes your choice of either the Fleur De Lis or Star on each leg providing an elegant yet unique look to your game room. It is available in either Espresso or Cinammon finish but is available in a 7ft or 8ft feature. 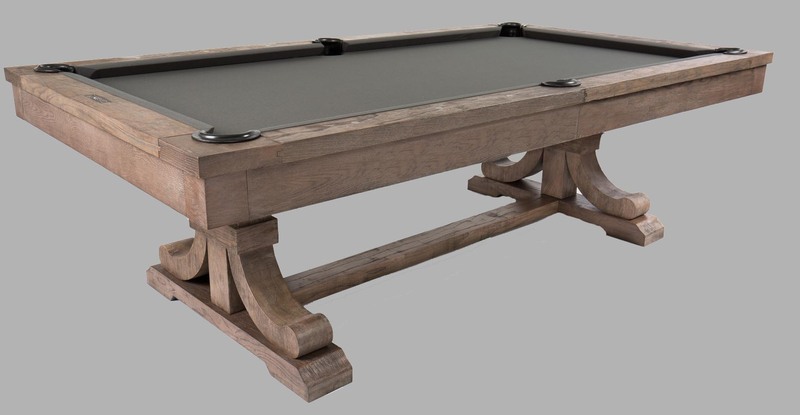 The Kariba is a solid wood pool table with a transitional design in an in-vogue charcoal finish. This table comes in either a 7ft or 8ft option with the optional dining top and bench available. 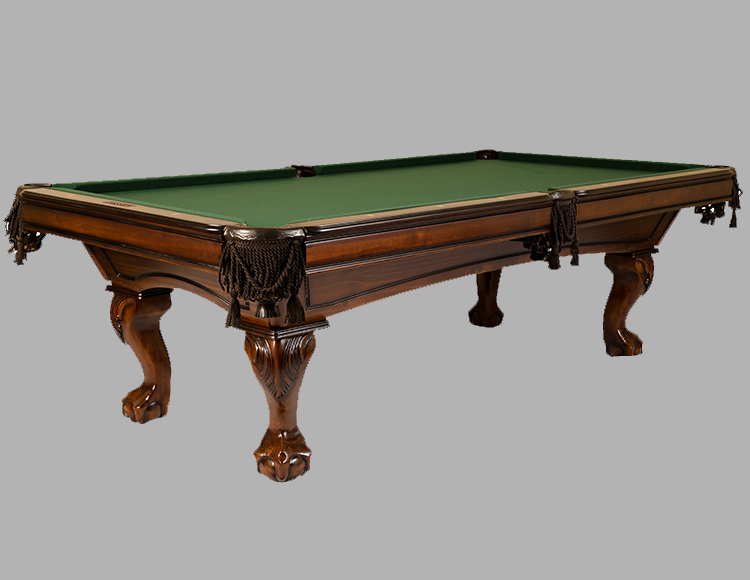 The Kruger is a beautiful, solid Tropical Conifer table that comes in a very unique Dark Chocolate finish and is available in a 7ft and 8ft size for your best game room experience. It also has the option of either the Ball and Claw or a Tapered leg and your choice of Fringe or Leather Shield pockets. The Legend is a name of its own. Its legendary unique designs in the African Mahogany Wood provides an elegant look with the contrasting low lights on the legs and blinds all around the table. It is only available in a Mocha finish and comes in 8ft alone. 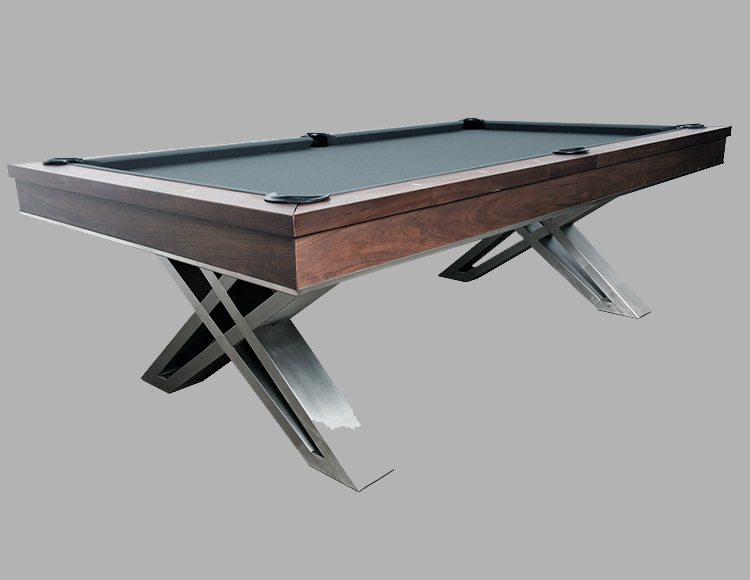 The Vegas has its own unique contemporary style with its brushed aluminum accents. It contains a wide top rail with the diamond sights. It is available in a 8ft option with a pedestal leg option. The Carmel is a exquisite Oak table with a salvaged natural finish. It stands out with its bold shape and unique coloring. 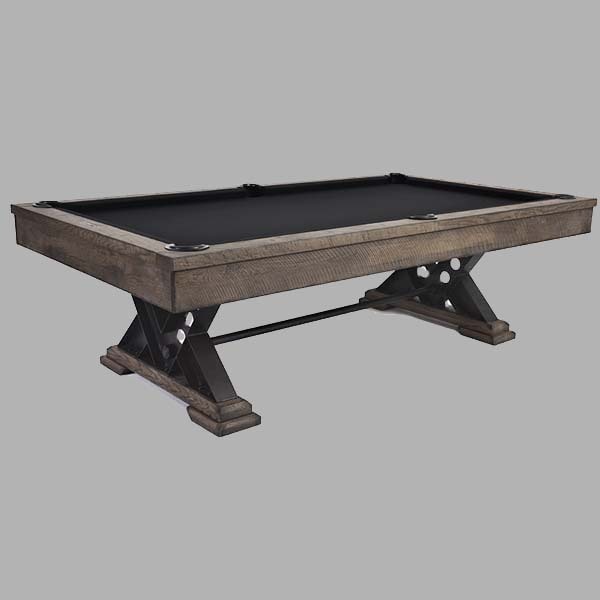 This table will beautifully compliment any home and is available in a 7 or 8 foot option. Additional options for the table is a dining top table and a bench for either side. The Vienna is a silvered oak table sure to be the focal point of any room with its unique metal pedastel legs and crossbeam. This table is avaibale in an 8 foot option only. The Monroe is a classicly designed table made from Tropical Conifer. 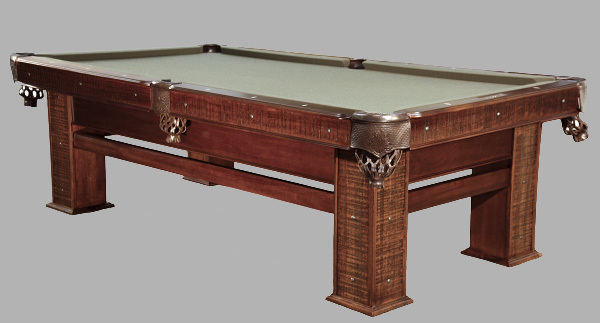 It features a a two tone walnut finish with dark highlights that accentuate the detailed carving on the legs. This table is available in both 7 and 8 foot with fringe pockets. The Carter is a stylish Transitional style solid wood table made from African Mahogany with rhino-tuff Maculata rails which are extremely dent and scratch resistant. The pedestal legs and gray walnut finish on this table will look elegant in any home. 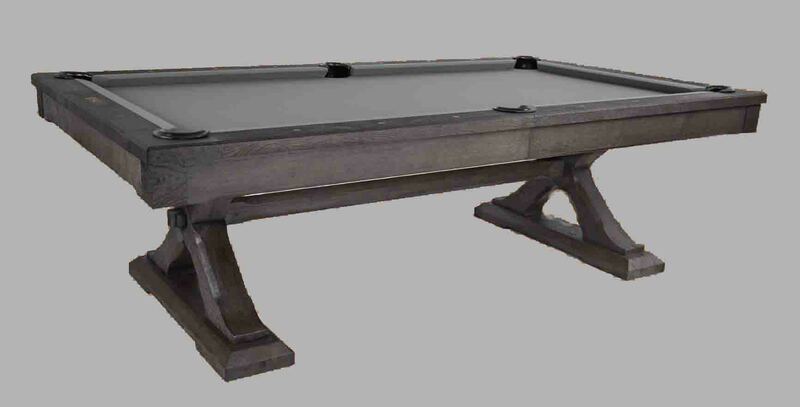 This table only comes in an 8 foot option with your choice of leather shield or fringe pockets. The Silverton is made from African Mahogany with a rustic barndoor gray finish. It has metal accents on the corners and stretchers making this a sturdy table for the demands of an active family. 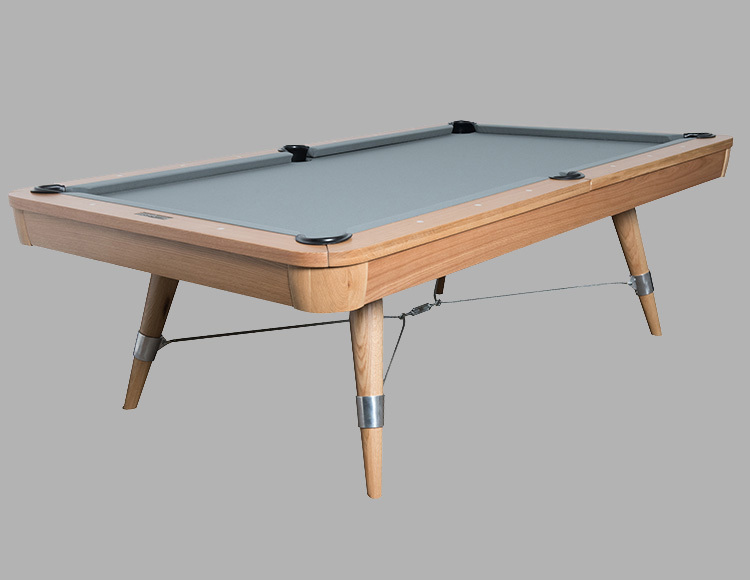 This table only comes in an 8 foot option with leather drop pockets. The Haven is an African Mahogany & Maculata table in a rich Espresso finish. It is only available in an 8ft option but boasts a unique space saving storage drawer. The Madison is an African Mahogany in a sleek Black finish with transitional legs. 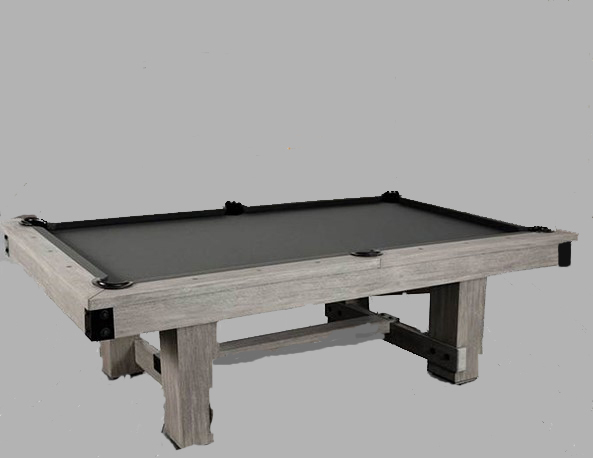 This table is available in either 7ft or 8ft option. The Hamilton is made of Aspen wood and finished in rich Espresso. This beauty has the optional dining top and bench available and comes in either a 7ft or 8ft option. The Bristol is a stunning modern table made from Solid Maculata Wood making it both Dent and Scratch Resistant. With its Natural Stain allowing the Grain to be visible and Post Leg design this table is the perfect addition to any setting. 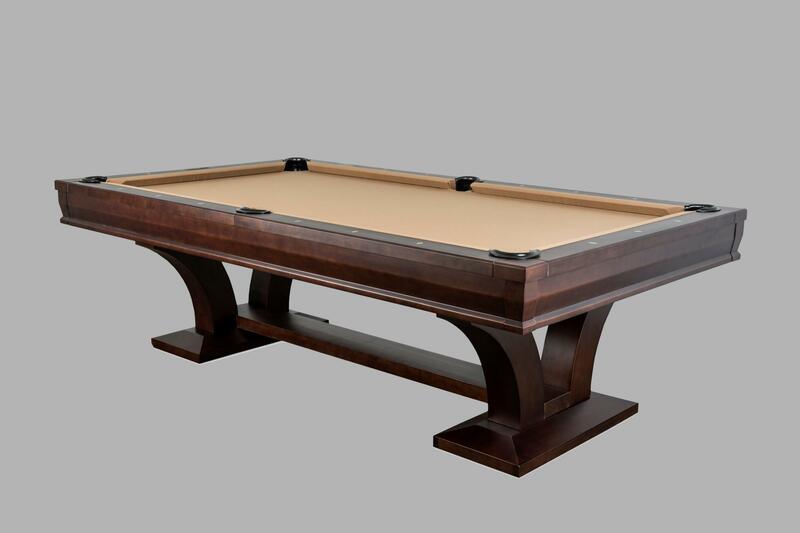 The Cape Town is a Eucalyptus crafted table that is available in a Dark Mahogany or Mocha finish. 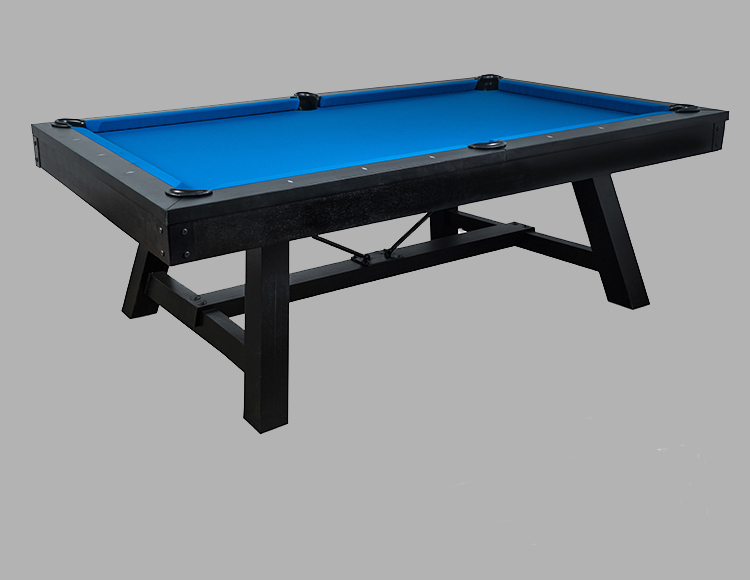 Its ball and claw leg option provides its elegant look and is available in a 7ft, 8ft or 9ft option. 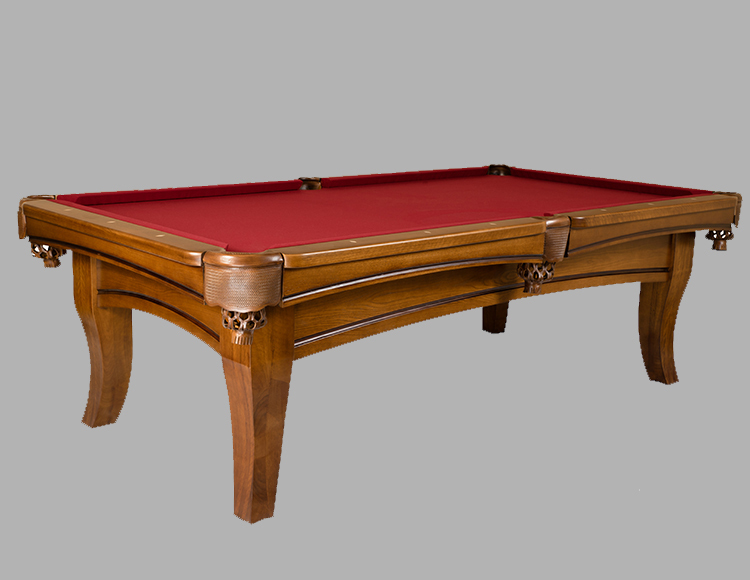 The Hartford is an African Mahogany table that is only available in a Mocha finish. And is also only available in a 8ft. 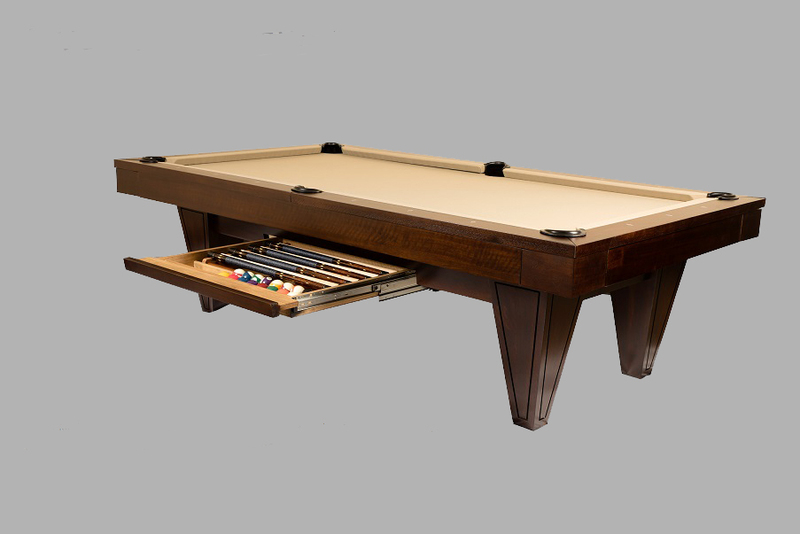 It does however include a stylish table feature with a fully functional drawer that will hold all your billiard accessories. 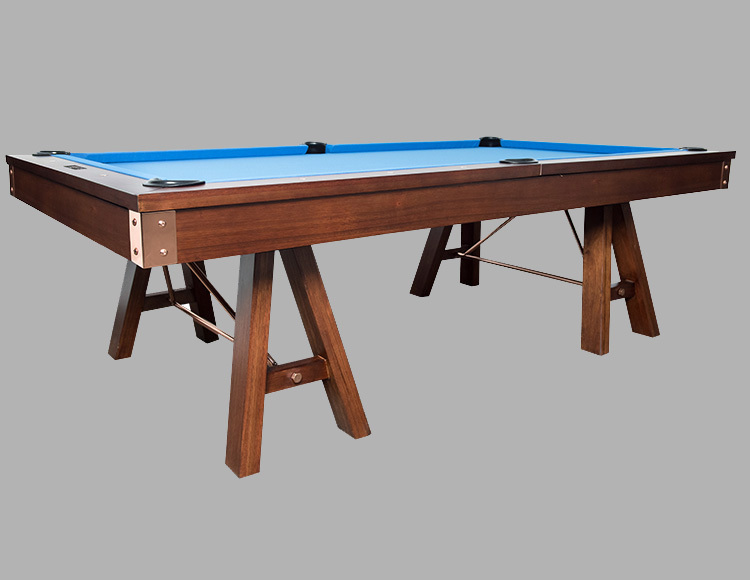 You can also match a Pullman Shuffleboard to maximize your best gaming experience in your home. The Cleveland features exquisite style and elegance with a grey walnut finish. Available in both 7ft and 8ft options with your choice of Queen Anne or Ball and Claw Legs and Leather Shield(shown) or Fringed Pockets. 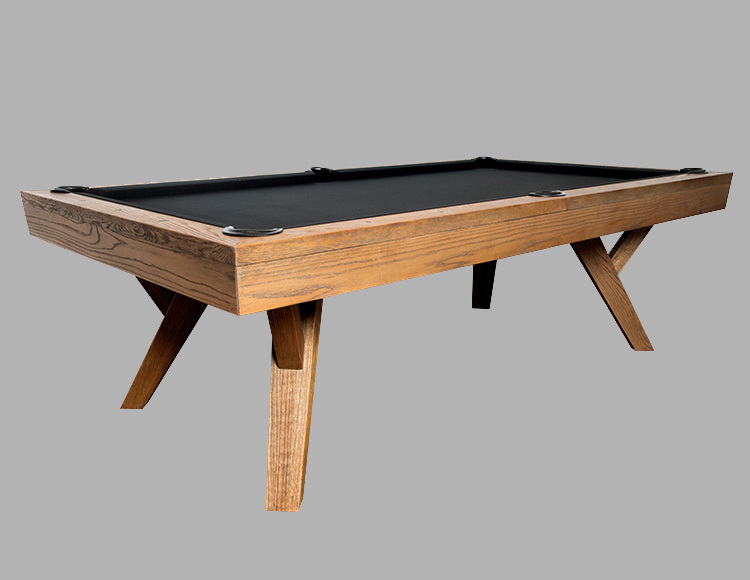 The Johnson is a unique table featuring A-Frame Legs with Copper Support Beams and Apron Corners and a Tobacco Finish. This table is available in an 8ft option only. The Pierce features Stainless Steel Legs and is available in both Natural Oak or a Walnut Finish with Leather Drop Pockets. This table is available in an 8ft option only. The Roosevelt is a Classic meets Rustic table with its Cable Suspension Support and Contemporary Style. Finished in Natural Oak with Leather Drop Pockets this table is available in an 8ft option only. The Tyler is a Rustic Oak table with Leather Drop Pockets and available in an 8ft option only. With its understated elegance it will stand out in any setting. The Ford is a stunner with Cast Iron Legs featuring Fleur de Lis designs. Double Crossbars add maximum support this table. With a Slate Grey Finish, metal corners, apron trim and Leather Drop Pockets this table is sure to command attention in any setting. 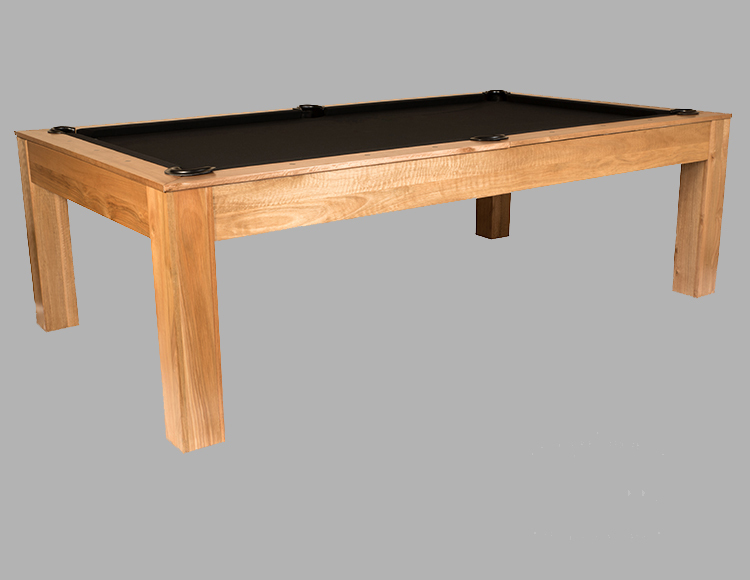 This table is available in both 7ft and 8ft options.